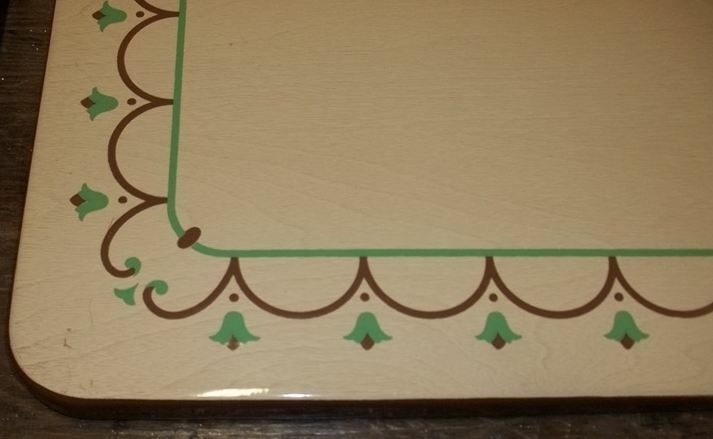 Look at this rare and lovely prettiness: A porcelain enamel table top — New Old Stock — manufactured in August 1947 — painted with lovely brown scallops and green tulips over a creamy faux bois background. I don’t have the back story, but I do have permission to publish the photos of this marvelous ebay listing currently under way. 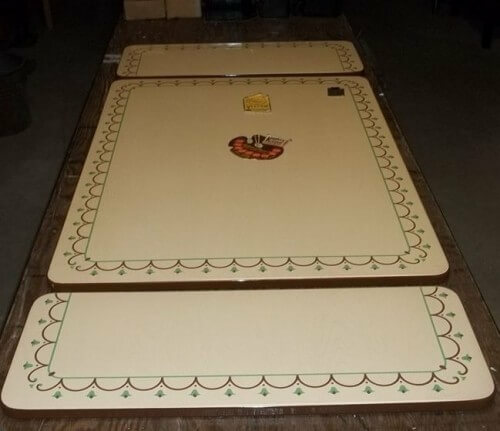 You will recall, I just recently published reader Robin’s genius idea to repurpose table tops like these as kitchen islands or whatnot. Don’t think I didn’t contemplate keeping this find all to my evil grabby self, to use somehow in my office, where I am still assembling counter top areas. Lucky for somebody else maybe, I am not in the spendy mood right now. …a Vintage New (NOS) NEVER USED Porcelain Enamel Table Top GREAT BROWN & GREEN WITH WHAT LOOKS LIKE TULIPS. It was found in the original shipping box from Sears and Roebuck THE BOX WAS ALL DRYED OUT SO IT WAS TOSSED. 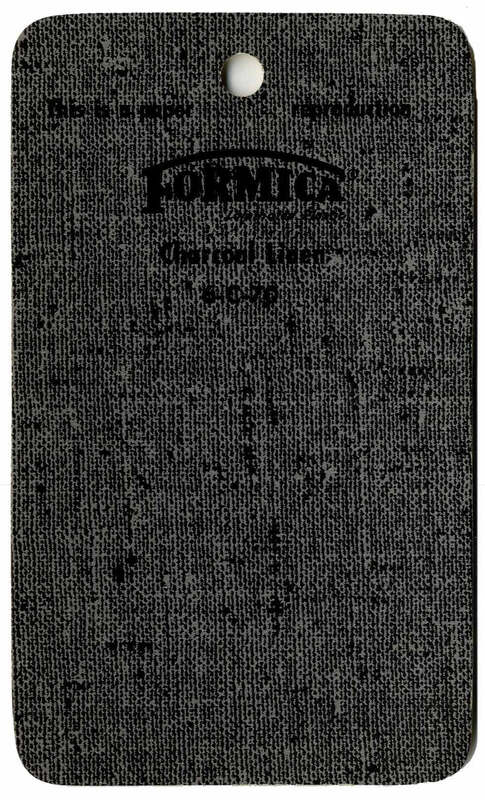 This table top measures 42×32 LEAFS ARE 12X32. IT HAS NO DAMAGE NO DINGS BREAKS OR REPAIRS. 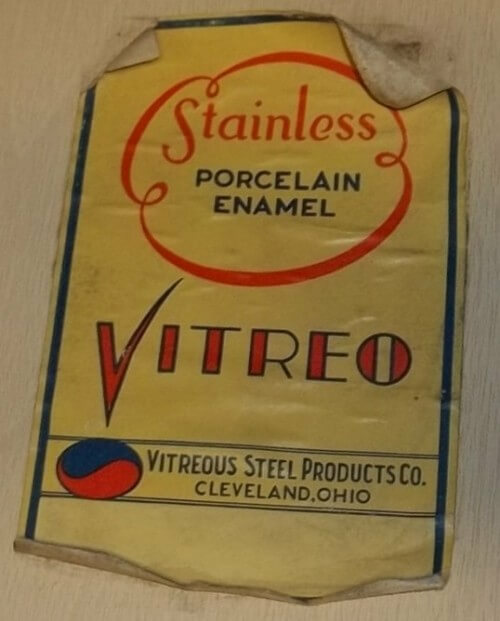 There is a sticker on the white table part that says ” Stainless Porcelain Enamel Vitreo, Vitreous Steel Products Steel Co, Cleveland, Ohio. 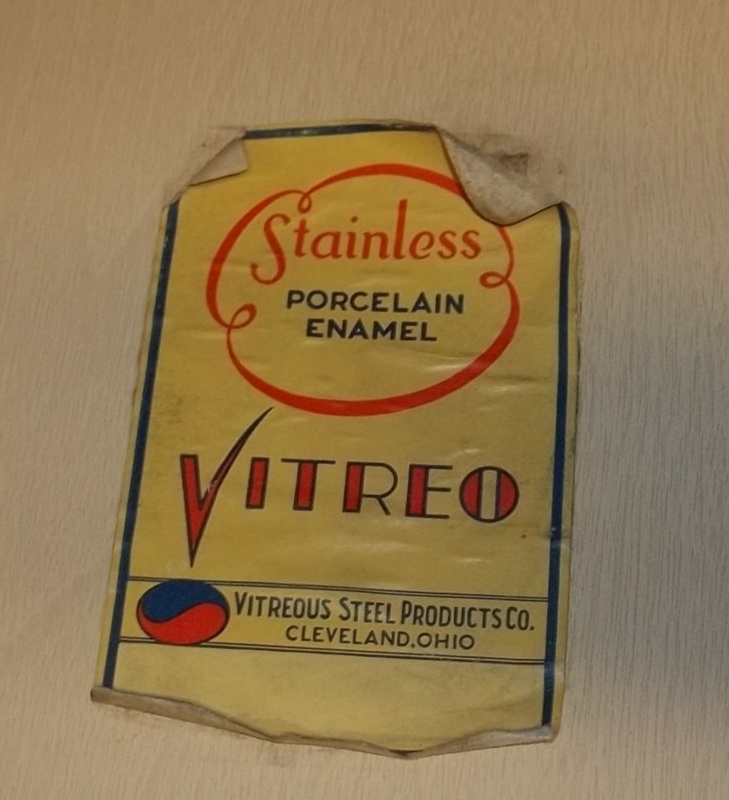 There is another sticker that says Genuine Porcelain Enamel, The Lifetime Finish. 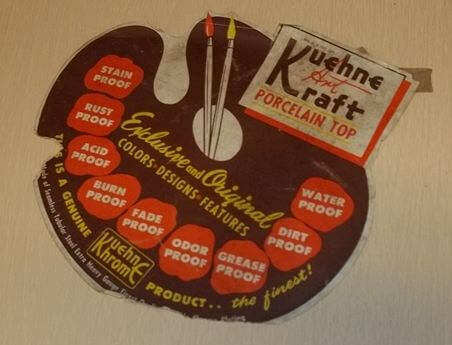 Note, the sticker on the front indicates the table top was made by Kuehne Khrome, which calls this a Kuehne Art Kraft Porcelain Top. Love it! Is it still up for grabs. Might do a whole kitchen nook around it. Hi Ed, we don’t have this kind of list. 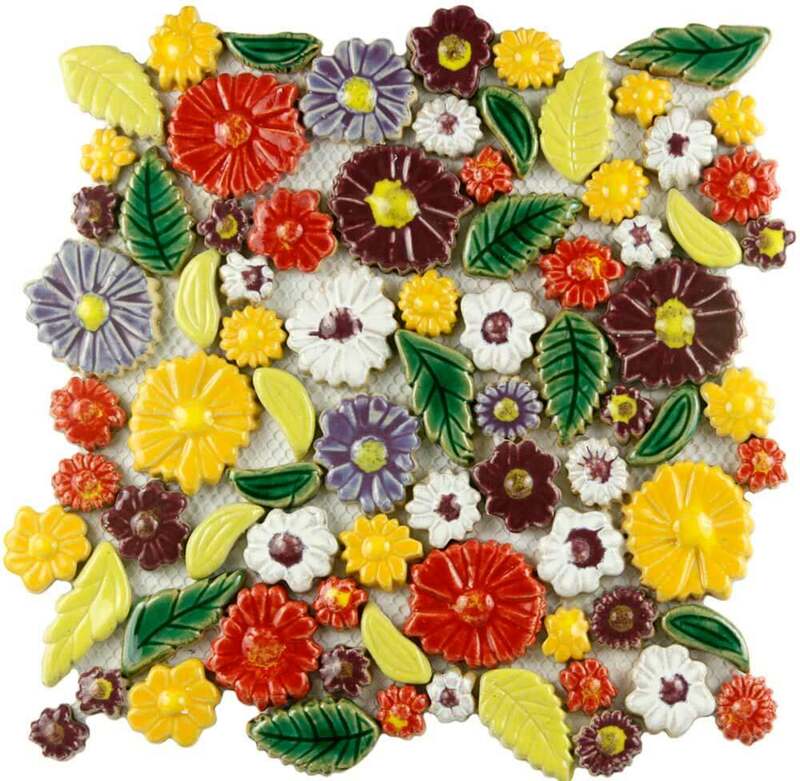 You could try companies that do painting on metal – industrial painting, auto body shops, etc. Good luck. Thank you! Never thought of body shop.. This table is spectacular! I have a black and white one that was my grandmothers. The chrome legs are shot. 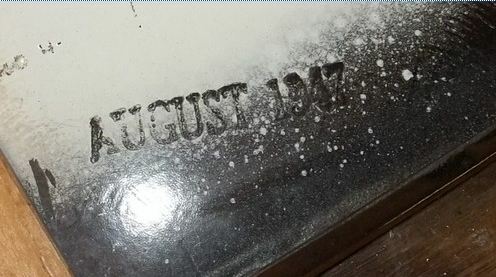 I was going to restore the whole thing, but this gave me an ingenious idea! 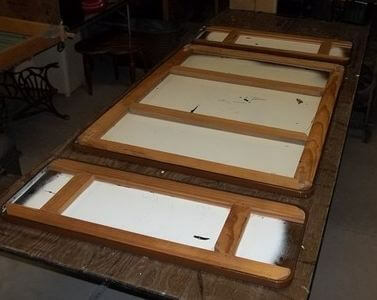 I am going to use the top (about the only thing left that does not need replaced) as the top for the island in my kitchen. 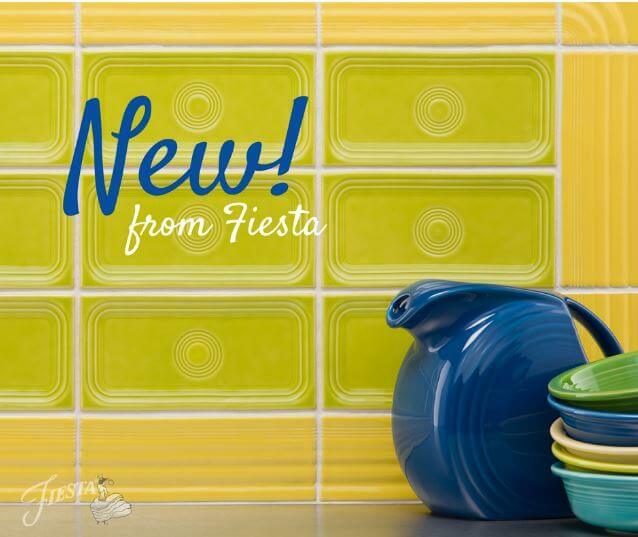 It will go great with my vintage sink!